How will the drop in oil prices affect European economies? As Bert Scholtens writes, the general expectation is that a fall in oil prices should help economic growth across Europe, but there are nevertheless a number of key factors which play an important role in how the price feeds into individual economies. It is also unclear what impact the oil price will have in other areas, such as attempts to transition to renewable energy. Oil prices have imploded. During the last six months, prices have fallen by more than 60 per cent. One rule of thumb which has been suggested by economists is that an increase in oil prices of $20 per barrel will result in GDP growth within a given country being reduced by 0.25 per cent in the first year and 1 per cent after three years (depending on individual circumstances). For the sake of convenience, the impact of an oil price reduction could be assumed to be the opposite. Many analysts are therefore quite optimistic about the effect on the economies of most European countries. Note: The chart is compiled using the daily price from 4 January 2000 to 12 January 2015. Data from EIA. Several economists are even more optimistic about the impact of the drop in oil prices because of its impact on inflation. As it reduces inflation expectations, it will be more likely that the European Central Bank will intervene, which would support the stock market boom that has already started. Hence, the future seems bright for most of us, with the exception of the oil firms who will see lower revenues. Pessimists warn, however, that this might fuel another asset price bubble which could do enormous damage to European economies now that governments have almost completely run out of mechanisms for dealing with the prolonged economic crisis. There are nevertheless some important factors to take on board before subscribing to this analysis. First, it is important to determine what is driving the oil price change. Here, three aspects need to be accounted for. As an initial point, it should be noted that there is a difference between the physical and the virtual trade in oil contracts. On the physical market, the oil producers sell their oil to refineries who then process the oil. This contrasts with the ‘paper’ market, which deals in contracts to deliver oil on a particular future date. The most important contracts are the West Texas Intermediate (WTI), traded at the New York Mercantile Exchange, and North Sea oil (Brent), traded at ICE Futures in London. 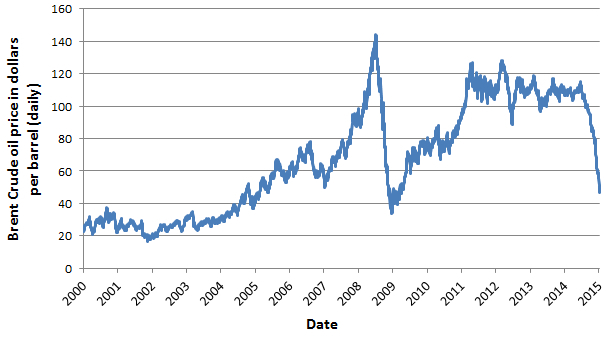 The ‘oil price’ is actually the price of the futures contract to deliver oil one month from now. This is not necessarily the price being paid on the physical market. It is more like a benchmark. Different types of traders are operating on the futures market. Only a small number of them will actually want to end up with barrels of oil. Others want to hedge oil price risk or want to speculate on differences between spot and futures prices. Most parties buy and sell on the basis of their expectations about what will happen on the physical market and about what they expect others to expect. The latter assessment, in particular, can result in volatile price movements as oversupply is often overestimated. Overshooting is an important characteristic of this type of market. While there may indeed be overshooting, however, it cannot be denied that there have also been structural changes occurring in the energy markets. Particularly within the US there have been remarkable technological changes that drive down the costs of capital expenditure and operating wells. This results from substantial energy technology research that was stimulated after 9/11 to secure the US’s energy independence. Furthermore, US firms benefit from tax advantages when they invest, and they also benefit from the relatively low price of natural gas in the US due to fracking. This gas is required in the refining of oil, which results in a relative cost advantage for US oil companies over non-US companies. This also explains why oil companies are not all being hit equally hard. For example, British Petroleum and Total from France were particularly badly hit as their market value has dropped by more than 30 per cent since June 2014. On the other hand, Royal Dutch Shell lost ‘only’ 20 per cent, while Exxon lost only 10 per cent. The result is that firms, particularly those that have been hit hardest, will have to reduce their costs and postpone or cancel investment projects. This trickles down to firms that supply services to the oil industry. There will also be smaller profits and dividends for shareholders. Here, the upside is that many other firms and projects face much lower costs and will therefore expand. In contrast to the size of cuts in the oil industry, however, this effect is not very clear. For instance, Goldman Sachs has estimated that the price fall might endanger $930 billion worth of projects in the global oil industry. Of course, this has been framed in most of the media coverage as a threat to jobs and incomes. That firms and households might benefit from lower energy costs is much less clear. This is due to the market power of energy companies and contracts which keep prices fixed for a particular period of time. On the other hand, while individuals will not simply drive an extra 30 per cent now that the fuel price has fallen by 30 per cent, they will consume other goods and services at a higher rate. The multiplier effect of this should trickle down to the economy at large, generating the kind of substantial gains from our economic ‘rule of thumb’ above. Alongside overshooting and competitive advantage changes, another key factor is that the role of OPEC has changed. OPEC producers generally have long-term contracts with parties in the US and Asia. They will not want to renege on these contracts. Hence, production elsewhere will have to drop. Here, it is important to recognise that there is a ‘merit order’ regarding the production of oil. The lowest ‘break-even’ production costs can be found in the Middle East (between $20 and $35 per barrel). Oil from the continental shelves usually costs about $40-45 to produce. Oil from deep sea wells and onshore outside of the Middle East generally costs between $50-55, whereas shale-oil in the US costs more than $ 60 per barrel to produce. Furthermore, many governments base their budgets on income from oil. As such, the price of oil needs to be much higher than the break-even costs if the governments want to balance their budgets. For example, the IMF estimates that for Kuwait and Qatar the oil price would need to be between $50 and 60 per barrel. But for Saudi Arabia, it has to be more than $100. For Libya, it needs to be more than $180. The oil producers face a prisoner’s dilemma: if all oil producers reduce their production, the price could increase, but this requires that all producers participate. Otherwise, the free riders will benefit. Currently, the tensions within OPEC appear high and it is unclear whether they will cooperate. A further question mark over the optimistic interpretation of the oil price fall is that people may not respond in a symmetric manner. Most of the estimations we have were done in relation to increases in oil prices. But whether the huge fall in oil prices will have an identical positive effect on the economy is far from certain. The last time the world saw such a huge drop was in 2008 and this was evidently not sufficient to avoid the economic crisis. Of course, one might reason that without this fall in prices the crisis could have been much worse, but we simply don’t know. Climate change is also a part of the discussion as it could be anticipated that a fall in the oil price may be a setback for attempts to transition to renewable energy. It is still much too early to tell whether this will be the case, but it is important to recognise that the drive toward renewables has gained momentum and is to some extent already relatively disconnected from developments in the context of fossil fuels. Just as a shortage of stones was not the primary cause of the end of the Stone Age, it is not the shortage of fossil fuels that will bring about the next energy transformation. Of course, relative prices play a role – and here the current price of oil could result in a delay. However the prices of fossil fuels are private prices, while the social costs of using these fuels are not accounted for. So far, the international political community has proven unable to address this and arrive at a sustainable solution. Finally, developments within the oil markets do not occur in isolation. They interact with economic development and social change, as well as with international political changes. The economy is part of society, rather than something that works in a mechanical sense, and the impact of changes in the oil price will be highly specific to the individual circumstances of different households in different locations. The change in the oil price is far from a zero sum game and, as with many economic changes, some will benefit while others lose out, ensuring there remains plenty of food (or oil) for thought. Bert Scholtens is the J.L. Bouma Chair in the Economics of Sustainability and Professor at the Department of Economics, Econometrics and Finance at the University of Groningen, the Netherlands. He is also a Finance Professor in the School of Management at the University of St Andrews, Scotland, UK.